Welcome to She Makes and Bakes! Hi! I'm Emily, and I have a *cough* mild obsession with cooking and baking. My husband wonders why I'm asking what he wants for dinner tomorrow when we're eating dinner tonight. I love thinking about meals and desserts, planning menus, entertaining, reading food blogs, and watching tv and movies about food. One day, I would love to go to culinary and/or pastry school, but for now I am mostly self-taught with a few helpful classes under my belt. Some of you may think my love for food is crazy and others will understand completely. Regardless of whether you love food, I hope you visit often to find new recipes for yourself and your family. I love to make and bake, and hopefully I can pass that bug to some of my readers. Happy cooking and baking friends! 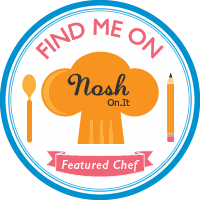 Once I have more recipes posted, check out the recipe index to do your own menu planning. The ramblings page will have personal stories and updates from time to time, but the main content around here will be food, food, and more food! Here's some cupcakes I baked last weekend: red velvet, carrot, key lime, lemon, and vanilla bean. Thanks Tonya! That is so sweet!